The DC5100 is a stylish yet powerful machine for all of your sewing needs. 167 built-in stitches, including an alphabet and 5 one-step buttonholes ensure that you have all the stitches you need for any task. You’ll find a wide range of ease of use features, including an LCD screen and touchpad for easy navigation, and a memorized needle up/down. The DC5100 is equipped for a wide range of sewing applications, with drop feed, memory capability, and automatic thread tension control. This was singer best strongest made mechanical sewing machine singer made. It was designed for heavy sewing made to sew hours everyday. Will sew all fabrics even jeans and leather! Has top drop in bobbin, free arm. Fully automatic buttonholer. Just put button in and automatically makes buttonhole for that button all in one step! Has decorative stitches and all utility stitches! Has automatic tensions! No need to adjust from one fabric to another fabric! A coverstitch machine is essential for the sewist looking to achieve a professional finish. The CoverPro® 1000CPX’s innovative design is based on the marriage of an industrial-style cover hem machine and a convenient home machine. The resulting union has produced a high-speed, long arm, heavy-duty cover hem machine that looks and operates like a sewing machine. With a wide trip cover hem stitch, exclusive free arm configuration, and Janome’s Seam Tightening System™ (STS), the 1000CPX is the most advanced Cover Hem machine available. The Baby Lock Imagine is the first serger with no thread tensions. It does not have automatic tension, nor electronic tension. It simply has no tension. This non-tension system is called Automatic Thread Delivery. It is a patented feature only found on certain Baby Lock sergers. No matter what thread you use, or stitch you select, or fabric you have, the Baby Lock Imagine will make the perfect edge finish every single time. 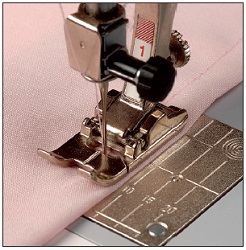 This SINGER® HEAVY DUTYsewing machine is a true workhorse. With a heavy duty metal interior frame, stainless steel bedplate, extra-high sewing speed and powerful motor, it can sew through just about anything you throw at it. Convenience features including an automatic needle threader, top drop-in bobbin, fully automatic 1-step buttonhole and drop feed for free motion sewing adds a new dimension of ease to heavy duty sewing. Discover all of the serging features you’ll need with the Eclipse SX2. This lightweight 4/3/2 thread serger uses differential feed for precise stitching and complete fabric control. Discover all of the serging features you’ll need in the easy-to-use Eclipse SX2. This serger gives every project a finished look with precise stitching, differential feed and the patented Easy Glide Thread System. This is the standard foot for all basic, forward-feed sewing. The sole of this foot is flat, providing control as the fabric passes over the feed dogs. These feet have a bar running through the center of the feet in front of the needle. Use the bar as a guide for instances when a line of stitching is required close to a ridge or fold, such as for hemming, edgestitching, or joining two pieces of lace with the edges butted together. Two grooves under the sole of a buttonhole foot (below left) allow the fabric to move freely as the thread builds up to form the end bars of the buttonhole. The guide between the grooves helps keep the side bars parallel and slightly apart. 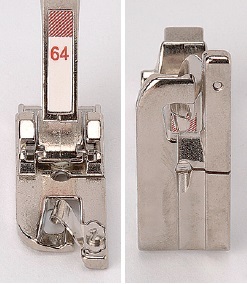 If your machine has a fully automatic buttonhole presser foot (below right), a button is placed in the back of the foot and the machine gauges the correct buttonhole length to fit. A large groove in the sole of these feet allows heavier threads, cording, and other high-relief decorative trims to pass freely under the foot after being stitched. A darning foot is spring loaded, hopping over the surface while you move the fabric from side to side or backward and forward. This foot requires the feed dogs to be covered with a special stitch plate or to be lowered under the normal sole plate. This foot is completely open in front of the needle, making the work clearly visible. There is also a wedge-shaped indentation under the foot, which allows dense satin (zigzag) stitching to glide through without becoming jammed. The angle in the indentation makes it possible to follow curves easily. This is used with a twin needle to stitch pintucks, spacing the tucks by positioning the previous tuck in one of the grooves under the foot. The raw edge of the fabric is guided through a tunnel in this foot in front of the needle; it produces a perfectly folded and stitched narrow hem. A walking foot is the perfect tool for machine-quilting straight lines across the three layers—top, batting, and backing—of a quilt. The walking foot works in unison with the lower feed dogs, passing upper layers of fabric under the foot at the same rate as the lower layers. Its name comes from the way the foot moves up and down, “walking” across the uppermost layer of fabric rather than pressing against it. 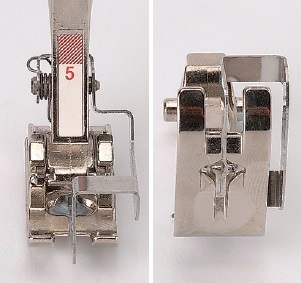 This all-purpose presser foot is the default for most straight and zigzag stitching, and even many decorative stitches. Use with an overcasting stitch to allow thread to wrap around the edge of the fabric to prevent unraveling. The foot guides the fabric and keeps your edges flat by compensating for the lack of friction when the needle makes the right-most stitch. Particularly good for finishing off medium to heavyweight, easily frayed woven fabrics such as tweed, gabardine, and linen. 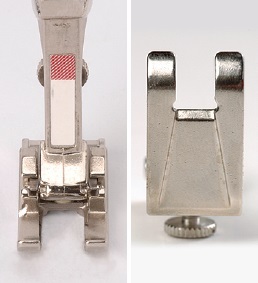 The Freemotion Quilting feet are available in two styles; Open Toe and Closed Toe. Open Toe Foot for general use and extra visibility, and the Closed Toe Foot for general use with lace and catchable fabrics. The feet are available for high shank and low shank machines. This invisible zipper foot makes inserting invisible zippers very easy. The grooves on the bottom of the foot hold the zipper coils in place to avoid any slipping while sewing. This provides an invisible closure on skirts dresses and all garments and can be used on other projects as well. 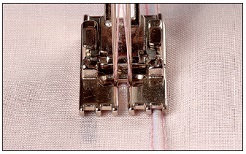 The straight stitch foot is often used on very fine or very heavy fabrics. This particular foot is flat on the underside to provide an even pressure against the feed dogs and it has a rounded needle hole which offers the benefit of more support around the needle to prevent skipped stitches and puckering. 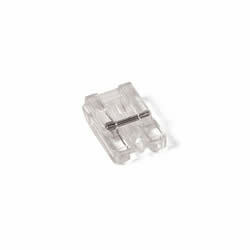 This presser foot is shorter than most for easier maneuvering around curves and corners when sewing applique pieces. Made of clear plastic for easier viewing as you sew. The 1/4” foot is very useful for quilters. A 1/4” foot helps ensure that the distance from the needle to the edge of the foot is a scant 1/4” required for most piecing and quilting. Be sure to check the measurements of your seam even when using a 1/4” foot, though. 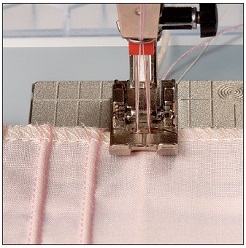 Some machines might require an adjustment of the needle to the right or left to stitch that perfect scant 1/4” seam.